A paramedic who allegedly slapped an elderly patient three times across the face was not unfairly dismissed, a tribunal has ruled. Former RAF medic Gareth Lewis, who was based in Queensferry, Flintshire, was sacked after a colleague reported him. 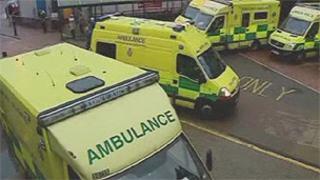 A tribunal in Rhyl heard Mr Lewis was sacked by the Welsh Ambulance Services Trust for gross misconduct. Mr Lewis said he tapped the woman, 69, three times on her face when she lost consciousness. Mr Lewis, who had worked for the Welsh Ambulance Service for a decade, said it was a recognised technique used in the RAF to assess a patient's level of consciousness. He claimed unfair dismissal and that he had been punished more severely than others who had breached guidelines. But a disciplinary panel ruled it was tantamount to assault, which constituted gross misconduct - a decision that was upheld at an internal appeal. At the tribunal, Mr Lewis said: "It was the first and only time I have used that method and, on reflection, it is not a method I will use in future." He had also submitted 14 letters of thanks which he had received over a 12 month period from patients. Employment judge Roger Harper said the tribunal's decision was unanimous. However, it had not been decided whether Mr Lewis' actions had fallen short of the professional standard expected, but only whether the respondents' decision was reasonable and followed a reasonable investigation. He described Mr Lewis's testimonials, which included one from chief constable Mark Polin of North Wales Police, as "extremely impressive". He added Mr Lewis was a conscientious professional.